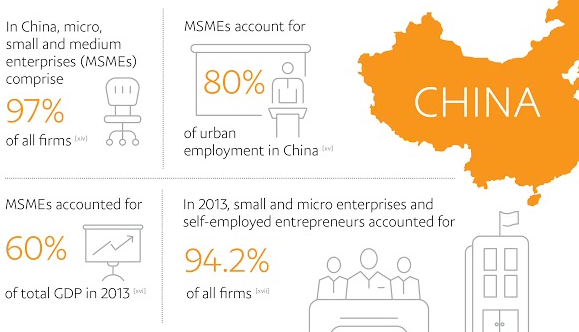 In China, micro, small and medium-sized enterprises make up 97% of all businesses. Small businesses play a critical role in the global economy, contributing to economic opportunity, diversity and the overall health of our communities. If current trends continue, however, we may soon wake up in a world where many of these businesses have closed and only a few of the very largest players remain open. This could have a dramatic impact on innovation, jobs, the widening income gap and communities around the world. If, however, we work together across the public, private and social sectors, we can democratise access to affordable tools that will enable businesses of all sizes to grow and thrive, fostering a vibrant economy and a more diverse and inclusive world. We’re already beginning to see consolidation of commerce in the form of businesses closing storefronts, cutting workforces and filing for bankruptcy – unable to compete in this new commercial environment. This trend is impacting markets globally. In the US, it’s estimated that about 10,000 retail jobs are lost monthly and more than 8,600 stores closed their doors in 2017 – the highest number on record. And a recent study by The Economist found that nearly two-thirds of the 900 sectors covered by the economic census were more concentrated in 2012 than they were in 1997. This consolidation has hit small and medium-sized businesses particularly hard, which is troubling considering that these businesses account for 60% to 70% of jobs in most OECD (Organisation for Economic Cooperation and Development) countries and a disproportionately large share of net new jobs. In India, the 46 million micro, small and medium-sized enterprises (or MSMEs) reportedly account for nearly 30% of the country’s total employment. And recent studies show that in China, MSMEs make up 97% of all businesses, 80% of urban employment and 60% of total GDP. The success of these businesses is critical for the economic health of their communities. One important factor leading to the consolidation we’ve seen in recent years is the rapid rise and adoption of mobile technology. Consumers are turning to their mobile devices as their primary channel for engaging in commercial activity. 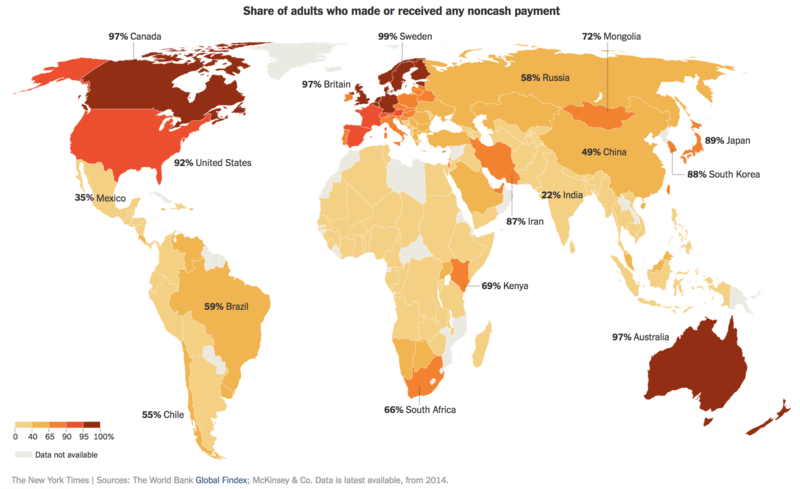 This shift to mobile is happening all around us – from Kenya, where more than half of the population reports having used their mobile phones to make a payment, to Sweden, where the country is rapidly converting into a cashless economy. As smartphone adoption continues to drive increased internet connectivity and usage, this trend will only accelerate. Over the next several years, this shift to mobile will be responsible for increasingly larger percentages of commerce globally. Mobile is unlocking new opportunities and enabling businesses and consumers to connect at the point of discovery. But it is also consolidating commerce in the hands of a few who have the resources to build seamless commerce experiences on a global scale. As business shifts into new contexts – from mobile to social, to things like virtual and augmented realities – this consolidation will likely only increase. Companies like PayPal and Facebook, for example, are partnering to enable digital commerce in new contexts, like on social media. Through partnerships like these, even the smallest of businesses can open their doors to global consumers in the new contexts in which commerce is emerging. By working together across the technology and financial sectors, we can democratise access to the tools that can help create opportunities for businesses of all sizes. Since the Great Recession, banks have reduced the number and size of loans extended to small businesses, which has made it even more challenging for entrepreneurs and small businesses to launch, grow and scale. Studies show that decreases in lending can further contribute to consolidation. Meanwhile, advances in technology and big data, as well as new means of assessing creditworthiness, have made it easier, safer and more cost effective for the public and private sectors – and even individuals – to extend financing to businesses. With this decrease in financing, fintech companies – often in partnership with banks – are stepping in to provide access to affordable capital so that enterprises can invest back into their businesses and, in turn, their communities. Non-profit organizations like Kiva, are helping to bring microloans – and opportunity – to entrepreneurs and small businesses around the world. And think-tanks like the Milken Institute are partnering with global organisations, like the World Bank, to fund small businesses in developing countries and create jobs. But still, much more can be done. Brick and mortar businesses today are limited in the customer base they can reach. Yet reports show that people increasingly want to shop across borders to find unique goods and competitive prices. According to Forrester, cross-border shopping will make up 20% of all ecommerce within the next five years. Despite this, the World Bank reports that only about 9% of small businesses and 16% of medium-sized businesses in low-income countries sell online. Even in upper-middle-income countries, less than 30% of small businesses and less than 40% of medium-sized businesses sell online. Small businesses need access to digital tools that open them up to global audiences. The financial, technological and logistical tools that can help small businesses enter global markets, exist today. Through partnership, we can make these tools more accessible. Together, the public sector and trade associations can invest in educating local entrepreneurs about the importance of digitizing their businesses and selling internationally. Local businesses looking for ways to grow, impact investors interested in financing social good projects, and fintech companies that can provide the needed technological and financial tools, should work together to expand access to these capabilities. This will help drive commerce to millions of the small and medium-sized businesses that are responsible for so much economic growth and employment. We have the opportunity to build a more vibrant and inclusive economy – one that inspires entrepreneurs to get started and supports small businesses as they grow. Through collaboration across the financial services ecosystem, governments, multilateral organisations, non-profits and think tanks, we can democratise access to mobile commerce capabilities, expand access to affordable financing and equip businesses with the tools needed to compete on the global stage. Together, we can foster greater economic development and a more inclusive society that will fuel global growth, prosperity and equality.